Lawn maintenance goes far beyond regular mowing. For the pristine lawn that will have you the envy of the whole neighborhood, meticulous lawn maintenance is the order, and you may not even know all that is involved! First, you have to prepare your lawn for seeding, if seeding is in fact necessary. You may also need to aerate your lawn, or consider "thatching" or laying down a thick layer of organic matter in the spring time to facilitate new growth. While you're seeding, you may also want to consider an anti-grub treatment. Grubs not only turn into beetles, which can wreak havoc on your other floral feature, but the grubs are the delicacy of choice for crows and other birds, which have no qualms about ripping up your beautiful lawn to get to them. Once your seed is down, you'll need to water generously. And the same goes if you already have a beautiful lawn and are just fertilizing to prepare for summer. If you don't already have a good irrigation system installed in your house, a timed lawn misting system will not only assure you're giving your lawn the hydration it needs - you'll also conserve water, and thus, your water bill. With luck and a wink from mother nature, you should have a beautiful green lawn - but your work doesn't stop here. Ongoing watering, mowing, raking, edging, and careful monitoring of crabgrass growth makes lawn maintenance a full time job. If this sounds like more time and effort than you're willing to waste, look to a professional to help. 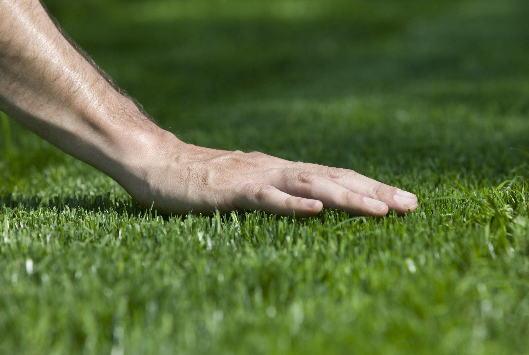 We are fully equipped to handle all the lawn maintenance to keep your lawn looking the way you want. By entrusting us to your beautiful property, you can rest assured that you will in fact be in the envy of the neighborhood, without all the effort!